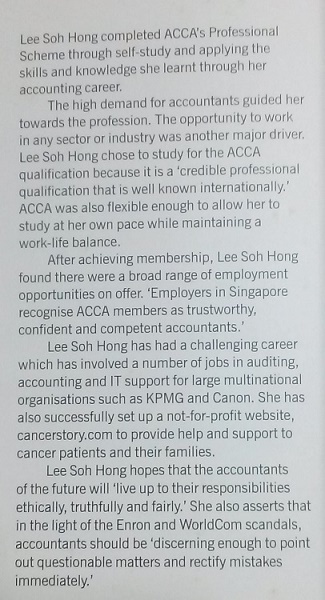 The author, Lee Soh Hong is the founder of Cancerstory.com. Cancerstory began with a sad story — the loss of her mother to colon cancer spurred her to set up this first cancer portal in Singapore in 2000. It had rendered much help to cancer patients and their caregivers over a period of eight years until October 2008 when she lost her father. In January 2009, she published her first book, “What Killed My Dad?” to recount her late father’s medical misadventures in a public hospital. In the same year, Cancerstory.com embarked on a new mission in championing patient safety - make our hospitals safe! To date, she has written 14 books. Complimentary copies of her books were extended to passionate healthcare workers, MOH and selected public hospitals, medical schools and nursing schools. In addition, she had delivered special sharing and talks at public forums and conferences. She often writes to express her views on certain healthcare issues, and also on challenges faced by VWOs in recruiting good people and complying with charity governance. On 22 April 2013, she was featured as the “Writer of the Week” in the Straits Times Forum. She became a role model to students when her story was included in Singapore’s Secondary One Higher Chinese textbook (2003). She is also the recipient of Reader’s Digest Inspiring Singaporean Award (2001) and Everyday Hero Award (2002).